If, like me, your New Year resolutions to eat less and exercise more are ancient history, then this column may come at a good time. It’s about pizza. More specifically, it’s about real pizza with solid roots in New York City, the capital of modern pizza and a place where people will travel miles for the best pizza in town. I heard about Pizza Garden from Jonathan Ornstein, Director of the Jewish Community Centre, Brooklyn resident and a pizza connoisseur of unabashed enthusiasm. Within minutes of finding out that a former employee of Grimaldi’s, a cult pizza joint that made the Brooklyn Bridge famous, had set up a restaurant in Krakow he was in a taxi speeding towards it. Jonathan’s been spreading the word to whoever will listen ever since so, one chilly Saturday in January, he and I set off there for lunch. I wouldn’t blame you for not having noticed the place — its location on ul. Konopnickiej has to be one of the most unfortunate I’ve seen here: on a busy highway, with no stopping outside let alone parking. However, once you get through the door you’re greeted by the sight of a huge hand-made, coal-fired pizza oven that radiates warmth, swiftly followed by an interesting selection of bottled craft beers lined up on the bar and one of the most smiley and welcoming waitresses I’ve ever met in Krakow. The Pizza Garden menu is much like many other pizza menus (although we didn’t get round to trying the desserts), but what comes out of the oven isn’t. Huge, thin, crispy, slightly charred pizza bases with sauce made of San Marzano tomatoes (believe me, you can taste the difference) and a variety of toppings. We had a simple ‘Margherita’ with garlic, a ‘Bronx’ with onions, tomatoes and mushrooms and a spectacular ‘Brooklyn’ with Italian sausage that was the real thing: ground pork with fennel seeds that introduced a subtle perfume to what was already an excellent pizza. It was reassuring to see the owner, Stanislaw Jaworski, at work in the kitchen but he took a moment off to tell us about his business. Having worked in the United States for a number of years, including at the famous Grimaldi’s, he settled in Krakow determined to make proper pizzas. 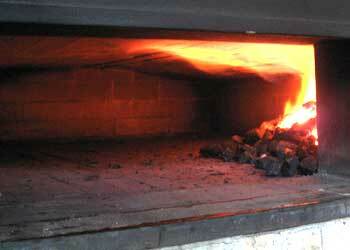 It took him three months to build the oven, which included persuading a local foundry to cast the doors. The oven is fired by anthracite, which is more temperamental than gas or wood, but is preferred by pizza lovers because it burns more cleanly than wood and gives out more heat than gas, resulting in a crispier pizza. He sources most of his products from Italy, the flour from a small mill in the Lublin area, and the craft, un-pasteurised beers from small Polish breweries. I decided to write about Pizza Garden because I’ve recently been struck by the appearance of a number of places in Krakow where the owners are clearly committed to quality over quantity. In a sea of mediocrity, I think they’re worth mentioning. Pizza Garden is one such place. They don’t do deliveries but it’s well worth the short but slightly complicated walk over to Dębniki to sample some of the best pizza this side of the Oder.